twice is nice: Bryton Pick - Floss in Seconds! Bryton Pick - Floss in Seconds! I want you to be honest with me, how honest do you floss? If you are like me, and the rest of my family...not too often, or only when you are getting ready to go to the dentist for your checkup every year. The product I am about to share with you, my readers, is a great way to floss without the hassle that comes with flossing! No pain, no worrying about throwing it away, or using too much/little. What does it look like? Its like a mini boomerang, with two ends that have stainless steel edges which do the job of fitting in between your teeth to get the job of flossing done! What's really about this product? Its flexible. Its re-usable for up to 30 days (made with germ-resistant stainless steel). It comes in a small credit card sized pouch you can fit into your purse or wallet. It doesn't hurt when you use it. Its very easy to clean. You can use it anytime, anywhere! 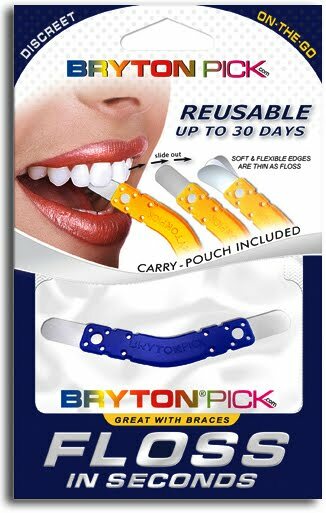 You can use it with braces (which I don't have, but I couldn't imagine how hard it is to floss with braces!). How do you use it? First off, make sure you are at least 10 years of age or older! Keep your mouth open in a smiling position. Gently insert either-end of the BrytonPick between your teeth. SLIDE between teeth INSIDE - OUT. The stainless steel cleaning edges may bend to adapt to your teeth. When finished, cleanse with napkin, tissue or hot water. Then you can store your BrytonPick in its credit card size carrying pouch. How much does it cost? According to their site, they sell for 4 individual 3 packs for $19.95. Not too shabby! What are my thoughts? I really liked using this product. At first, it was a little scary not knowing if it would hurt my gums...and it felt a little weird sticking this foreign object in between my teeth - but after that feeling of worry went away, I really liked the product. It got the job done, and I felt comfortable using it with no worries whatsoever. Thank You Tomoson & BrytonPick for selecting me to try out this product for free :) I really enjoyed looking at all the celebrities who used the product on their site too!